After visiting Bilyuin Pool last year in May we decided we should visit again this year after a much wetter few months at the beginning of this year than last year. We also decided to head there before it cooled down, so we could enjoy camping and walking without feeling the cold too much and we were there in April this year. When you live in a warm climate you do tend to feel the cold a lot more than those that live in cooler climates and so we usually plan to camp either to the north or south depending on the weather. 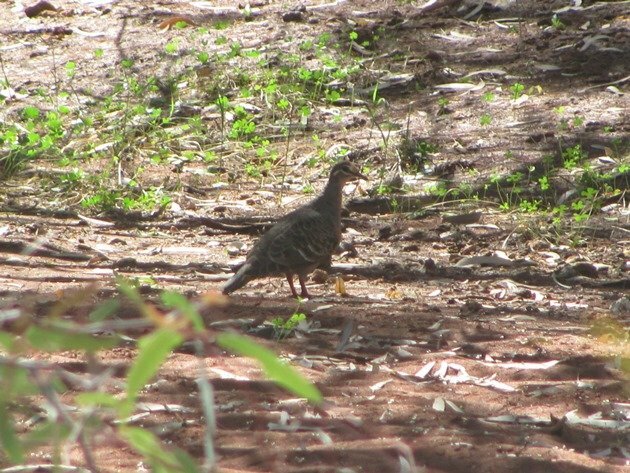 I mentioned recently about the arrival of the Black-tailed Native-hens at Bilyuin Pool this year, but of course there were many other species of birds to enjoy. 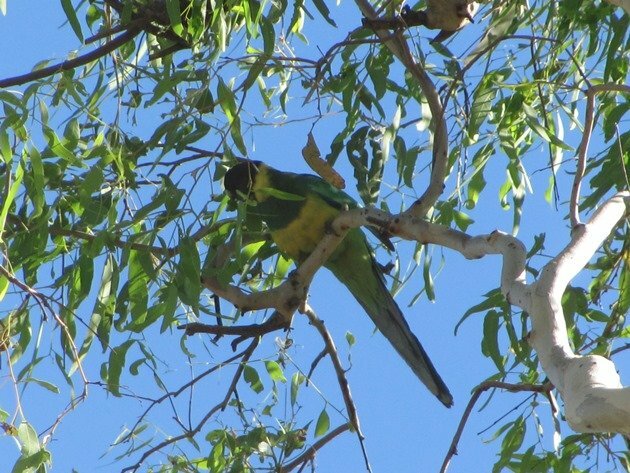 For several days we had seen large flocks of Budgerigars as we headed south and we were not surprised to see them at Bilyuin Pool. 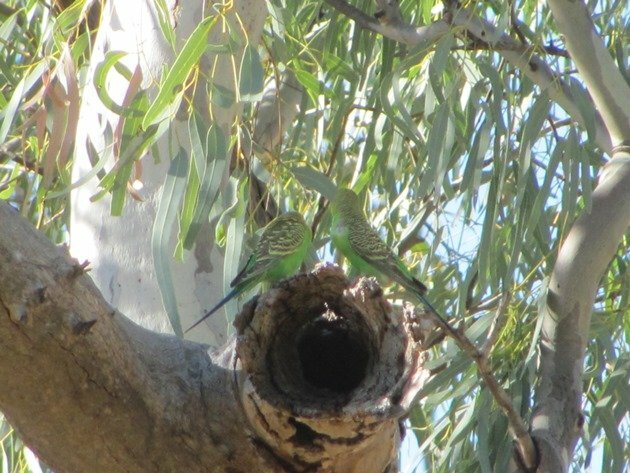 There are plenty of tree hollows for Budgerigars to nest in and no doubt there were nesting. 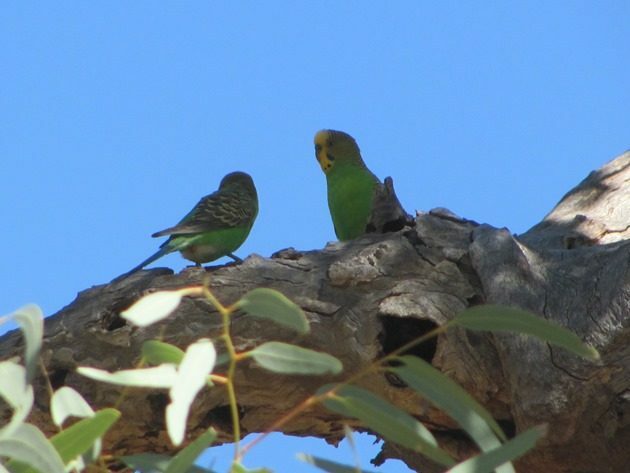 There was the constant chattering of pairs of Budgerigars around the area and they were accompanied at many of the larger trees with hollows by Australian Ringnecks also looking to nest. 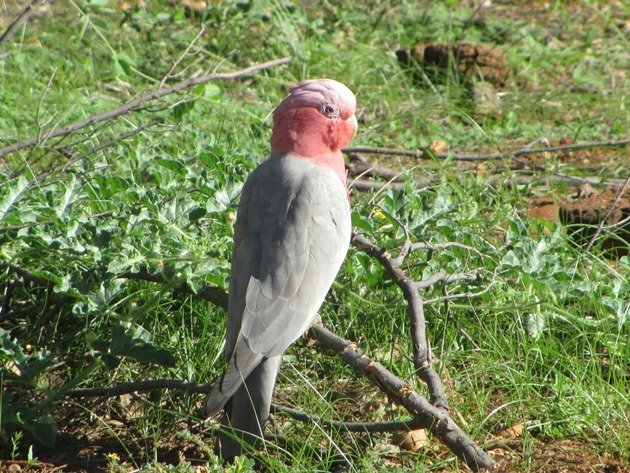 Galahs were also very common in the trees and on the ground as they nibbled away at the grasses that had grown over the previous few months. 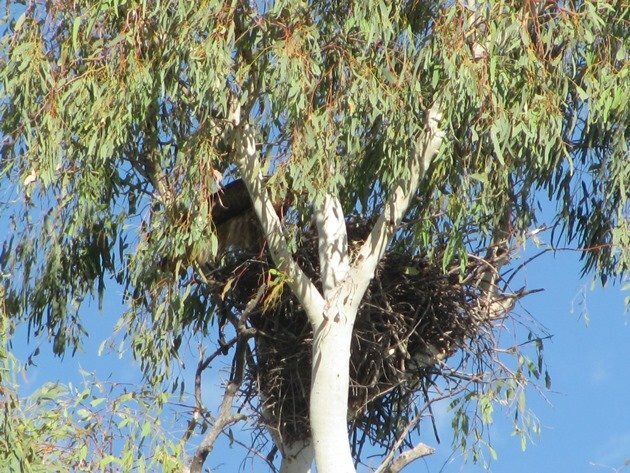 There had been a Whistling Kite nest across the water from where we camped last year and this year the nest was still present and had been made somewhat larger. There were two young Whistling Kites in the nest this year, but on dusk they would stretch out and looked like they would soon be leaving the nest to explore the area. Brown Falcons, a Brown Goshawk, Wedge-tailed Eagles and also a Nankeen Kestrel hunted in the general area of the pool and were seen regularly during the day. The pool itself was busy with not just the Black-tailed Native-hens swimming back and forth, but also being used by Grey Teal, Pacific Black Ducks, Australasian Grebes and Australian Wood Duck. There was also a lone Straw-necked Ibis and both a White-necked Heron and a White-faced Heron. Tree Martins were swooping low over the water during the day and a pair of Black-fronted Dotterels were feeding along the muddy edges. 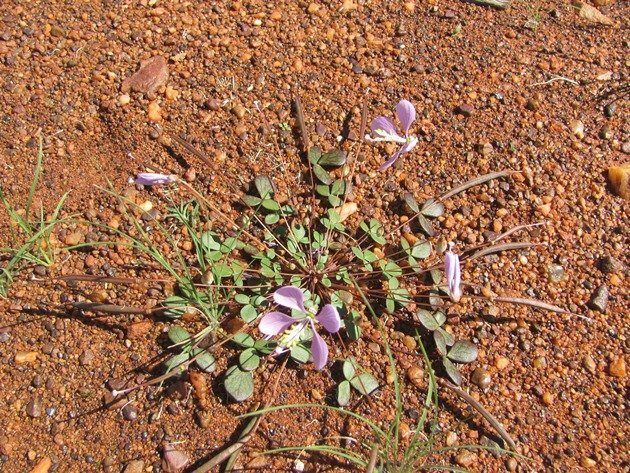 As is often the case the bush is not a particularly quiet place thanks to the Magpie-larks, Yellow-throated Miners, Grey-crowned Babblers, Rufous Whistlers, Rufous Songlark, Crested Bellbirds, Pied Butcherbirds, Western Magpies and Western Bowerbirds. Sitting quietly in the shade of the large trees you soon observe some of the quieter birds in the area and they included White-plumed Honeyeaters, Spiny-cheeked Honeyeaters, Zebra Finch, Willie Wagtails, Diamond Doves, Crested Pigeons, Black-faced Cuckoo-shrikes, White-winged Trillers, Sacred Kingfishers and Rainbow Bee-eaters. 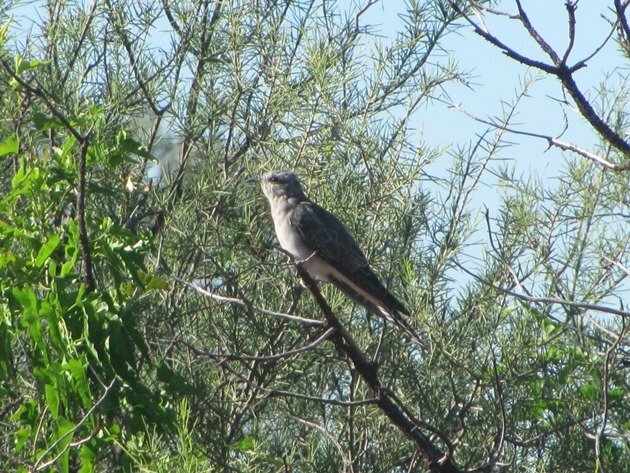 None of those bird species are truly quiet and you soon hear them when there are no other sounds other than the natural bush. As always we went bush walking around the area to see what other species were in the bush not far from the water. 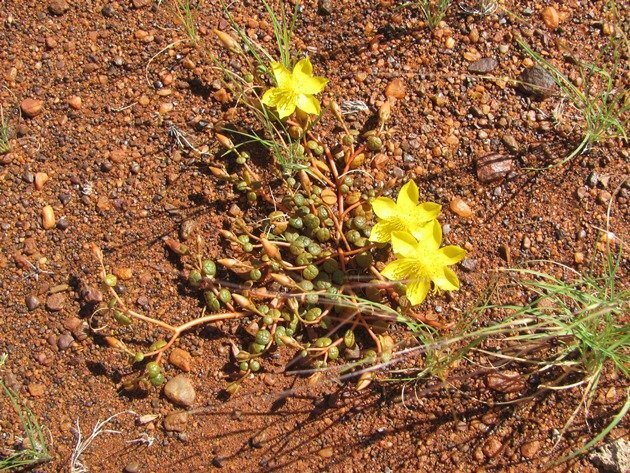 Despite it being an arid area for much of the year there were still some beautiful wildflowers that appear to survive in the harshest climate just like those in the Kimberley. We soon encountered several inquisitive Red-capped Robins, Splendid Fairy-wrens, a Red-backed Kingfisher, Mulga Parrots, Bourke’s Parrots, White-browed Babblers, Australasian Pipit and a Pallid Cuckoo. At one of the small pools of water left behind from when the river had been flowing there was a Common Bronzewing, which despite its name is not “commonly” seen when you are in the bush. Another large bird that can’t even fly can also be very good at eluding you! 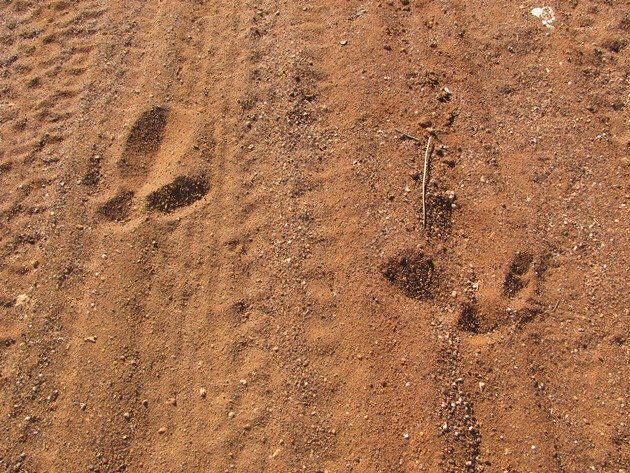 A pair of Emu had clearly walked along the track recently, but we did not observe them despite following the tracks for quite some time. 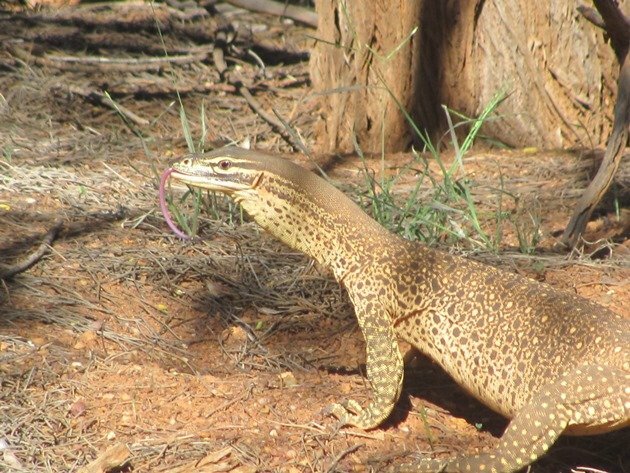 At the base of a tree we encountered a goanna busy digging away looking for food and we watched it for some time before moving on. It was unconcerned by our presence and had been digging around the area for quite some time judging by all of the large holes. On dusk we heard the familiar sound of the Australian Owlet-nightjar and the call of the Bush Stone-curlew during the night, so the sound of the bush did not end! 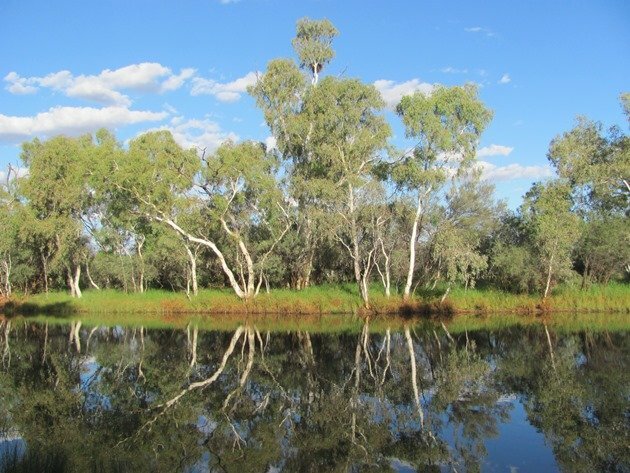 This is an excellent place to camp and enjoy the birds and the bush, but be aware that there are no facilities and intermittent reception for mobile phones. We also added a few birds to my 2017 Year List. 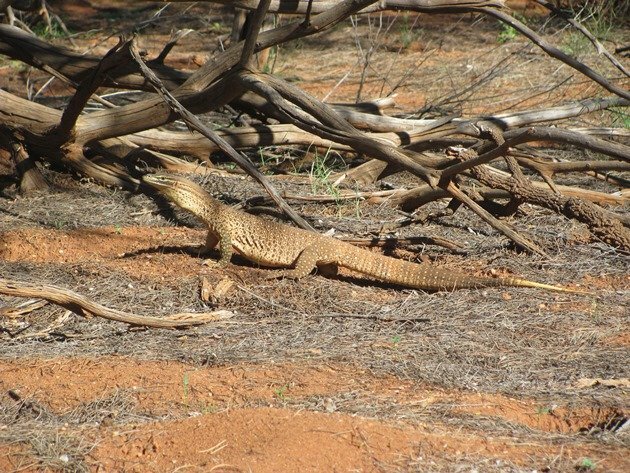 We love camping in the bush and all that nature has to offer! Where Are You Birding This First Weekend of November 2012?